Century Square’s renovations are finally about done and the malls spanking new look is definitely well worth the wait. Apart from that, the mall is packed with a whole bunch of new food options that have got out bellies rumbling. Amongst them is FrapasBar by the renowned Saveur. This new restaurant serves up delectable, authentic French fare and tapas with modern twists here and there—all while keeping prices affordable. Craving French? FrapasBar will not disappoint, especially not their S$15 lunch deals that feature both a fancy starter and a hearty main. Beautifully furnished with marble tables, plush chairs and a gorgeous circular bar decked out in wooden textures to match, this restaurant exudes vibes of a classic French cafe. Posh as the establishment might appear, rest assured that prices here are kept consistent with that of Saveur. 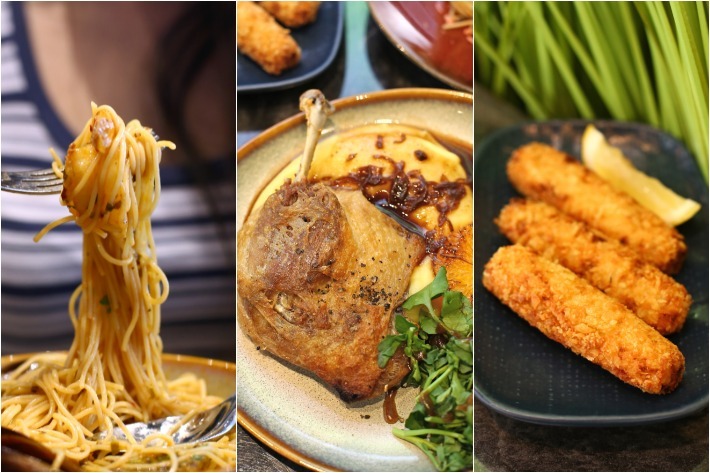 Their lunch deals are especially enticing—for just S$15++, you get an appetiser and a main. We started off with a plate of their Crabmeat Croquette (S$9), which featured crab meat that was mixed with fennel, cucumber, red chilli, spring onion, mayo and coconut. The croquette was nice and crisp on the outside, yet still managed to remain tender and juicy on the inside. The crab meat lent a subtle, sweet flavour to the croquettes which went well with the other components. We recommend adding a dash of lemon to it before you eat it — it really makes quite a difference! Next up, we had the Saveur Pasta (S$6) which consisted of angel hair pasta mixed with chilli oil, kombu, pork sauce and sakura ebi. The varying tastes and textures of all the ingredients came together to create a fragrant medley of flavours. The pasta was also cooked to a perfect al dente giving it a nice, slightly chewy texture. Moving on to the mains, we tried their Duck Confit (S$15), served on a bed of creamy mash and cooked to a lovely, golden crisp. Served alongside are a grilled orange round and a handful of fresh watercress. The confit of duck, was immensely crunchy while remaining tender and juicy on the inside. The mash, on the other hand, was in another league of its own and was lusciously creamy and delicious. Finally, we had a plate of their Seafood Bouillabaisse Pasta (S$16), which we have to admit is our favourite. This lip-smacking pasta dish consisted of angel hair pasta topped with fresh and juicy seafood such as mussels, squid, prawns and sea bass. The varying flavours of the seafood added a great depth of flavour and texture to the overall dish. We also like how generous they were with the amount of seafood they gave. Taking inspiration from the classic French stew, we’d say that they nailed the recipe down perfectly.